When you are doing distance runs such as marathons, you need to boost your endurance and power. There are many supplements that have become famous in the market, creatine being the most popular. Creatine for runners has been proven by scientists to improve strength and power. Although whether or not to use creatine is a personal decision, understanding the benefits of using this supplement is important. In this article, we will explain what creatine is and five benefits of using it for your runs. Creatine is a substance produced in the body that helps manufacture ATP (adenosine triphosphate). ATP is what the muscle uses for energy (1). Creatine is produced primarily by the liver. It can be found in protein-rich food such as meat and fish. Creatine is composed of amino acids which are why it plays a major role in the production of energy. For this reason, creatine is used by many athletes including runners to improve performance. Using Creatine supplements during your workout can greatly improve your performance. Consider the five following benefits of creatine supplementation. Creatine supplies your muscles with immediate energy during a workout. If you are engaging in endurance runs, your body needs a lot of energy. Normally, a combination of carbs, fats, and oxygen are required to produce ATP. At the beginning of a run, energy can be produced without oxygen but the longer you run, the more oxygen is required. With a higher oxygen requirement, your muscles may easily suffer from fatigue (2). Although researchers say that using creatine supplements right before a run does not provide the energy boost you expect, supplementing creatine can improve the quality of high-intensity workouts. When used during training, you can increase your endurance, power, and energy which will help you run more efficiently in a race (3). Because muscles are made up of protein, creatine can help increase your muscle mass. A bigger muscle mass allows you to do more reps, lift more weights and generally become stronger. With longer training sessions, your muscles in your legs can reach their potential (4). All these factors combined will allow you to improve your running performance. There have been multiple studies to prove the interaction of creatine supplementation and recovery after a workout. This is achieved by lowering the cell damage after workout which means your muscles can recover faster. For example, one study conducted in 2004 examined the effect of creatine upon inflammatory and muscle soreness after a 30km run (5). During the study, 18 male athletes were given 20 grams supplement for 5 days with 60 grams maltodextrin. Another group was supplemented with maltodextrin. At the end of the study, the group that took creatine supplement exhibited lower cell damage than the other group. This study concluded that using creatine as a supplement reduced cell damage after exercise. In a different study conducted in 2007, it was discovered that muscle damage and inflammation after running can be reduced by use of creatine supplements. However, creatine does not reduce cellular damage after high-intensity resistance exercises (6). According to researchers of Cell Biology in Switzerland, there is a relationship between the use of creatine and bone healing. In a study they conducted, creatine significantly enhanced the activity of a marker called ALP (alkaline Phosphate). ALP plays an important role in promoting bone growth and recovery (7). Since cell energy is vital to bone development and recovery, creatine enhances cell energy which in promotes bone formation. One of the loved benefits of creatine is its ability to increase muscle strength enabling you to complete more reps during your workout routine. Studies conducted show that those who take creatine supplements had a 25% increase in their one rep max on the squat. Being able to complete more reps makes your muscles stronger for your next run (8). Additional studies found that powerlifters gained 6-11 pounds of lean body weight in one month with creatine supplementation. Creatine is also known to stimulate the production of protein. More protein means more muscle. Since creatine absorbs water taking it from your blood to your muscles, your body will be able to produce more protein rapidly (9). As a runner, stronger and bigger muscles boils down to better endurance, stamina and overall better performance. Being able to increase your pre running training by gaining muscle enables you to economically use oxygen. Efficient oxygen usage means greater speed and endurance. One of the things that happen when we age is that we lose muscle mass. This is mostly due to the decline in the production of testosterone and other hormones that promote muscle growth. As mentioned, creatine enhances muscle strength and mass and it is these muscles that degenerate with age. In order to reduce the muscle loss, a hormone called IGF-1 is important. Sadly, as we age, the amount of this hormone produced is also reduced. Creatine has been found to help maintain the levels of this hormone as we age. According to researchers creatine has the potential to improve the production of IGF-1 in elderly people (10) . Another study conducted in 2003 confirmed the role of creatine in reducing the age-related mass loss when combined with a training routine (11). In the study, 28 men and women over 65 years old were divided into two groups. The first group was given a combination of 5 grams creatine and 2 grams dextrose while the second group was only given dextrose. After a 14-week resistance training program, the group that was supplemented with creatine had a greater muscle mass improvement. 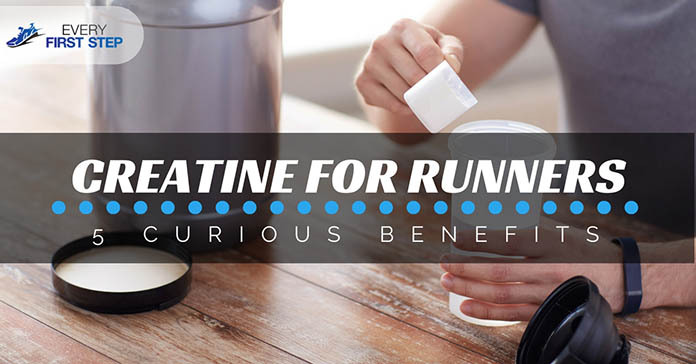 Now that we understand the reasons why creatine supplementation is a great way to improve your running ability, let us break down the different kinds of creatine you can choose from. Creatine Phosphate - this is a phosphorylated creatine that releases high reserves of energy. It is mostly used by the muscles to store energy that can be utilized for explosive exercises such as sprinting (12). Creatine Ethyl Ester - this is the kind of creatine that can give the most muscle building benefits. Creatine ethyl ester penetrates the cells faster increasing the rate at which protein is produced. It is recommended for those engaged in marathons or triathons (13). Creatine Monohydrate - this is the most common kind of creatine used by athletes. It is the creatine we have been talking about throughout this article. Kre-Alkalyn- this is considered to be the fastest absorbing kind of creatine among the rest making it popular for those who want immediate results (1﻿﻿4). Before you decide which of the mentioned kinds of creatine to take, watch this video to help you make the right choice. Creatine supplementation can be a great way for you to boost your running technique and endurance. Because the supplement boosts energy especially during your pre-run workouts, you will be able to accomplish more reps. This, in turn, will give you an increased muscle mass. In addition, creatine can help in bone healing and growth. Lastly, because of the ability of creatine to help in the promotion of the IGF-1 hormone, it may reduce muscle loss especially due to age. Before you decide to take creatine supplements, identify which one will fit your fitness goals and consider all the different types of creatine first. Did you enjoy this article? Have you ever used creatine in the past? What can you say about the supplement? We'd love to hear about your experiences in the comments below. Also, remember to share this information with other runners looking to boost their routine.